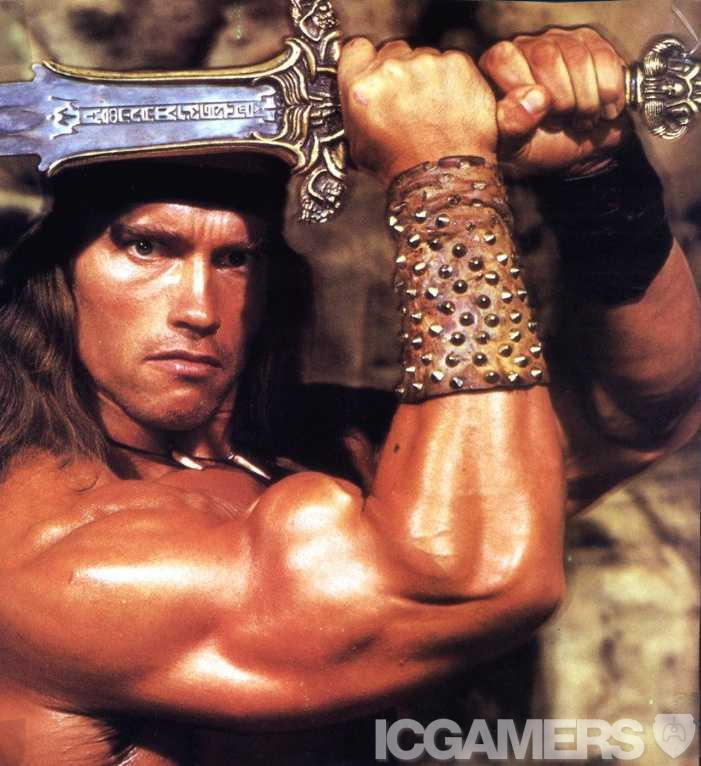 Okay everybody, bear with me for a minute as I heap some love upon the 1982 movie, Conan the Barbarian. Conan is a legitimately great movie. I could write a dissertation on that movie. Dammit, I should write a dissertation on that movie. But not now, not here. Suffice to say that the John Milius tale of a orphaned boy sold into slavery and his long, dark road to revenge is one of the most compelling tales of human will and the ironies of human suffering I’ve ever watched. This movie is, I feel, Schwatzenegger’s best performance of his career, and he mostly has Robert E Howard and John Milius to thank. The very next day, Conan’s father, mother, and all his people are slaughtered in a raid. He and the other children are sold off to slavery. Conan himself is tied to a mill wheel for his entire childhood, until he becomes literally as strong as an ox. And so begins his story. The Riddle of Steel is just that – a Riddle. Conan’s father does not know the answer. Conan lives most of his life under the illusion that the true ‘discipline’ of steel is a fine sword and a good suit of armor. It’s wealth, power, the trappings of glory, a fine horse and a full flagon of wine, all of which might be won by a good blade and the skill to wield it. He is, however, wrong. There comes a time, thief, when the jewels cease to sparkle, when the gold loses its luster, when the throne room becomes a prison, and all that is left is a father’s love for his child. That is strength, boy! That is power! What is steel compared to the hand that wields it? Look at the strength in your body, the desire in your heart, I gave you this! Such a waste. That is the ultimate trick to the riddle. Steel is nothing without flesh. Power over the flesh is power over steel, by definition. Even when told, Conan cannot accept the answer to this riddle. When he finally gains his revenge, when he casts down Thulsa Doom and destroys his snake-cult, he is left brooding on the steps of the Mountain of Power, trying to consider the implications of his ‘victory.’ We do not exult in Conan’s revenge and neither does the barbarian. He has not really ‘won’ anything – all he can do is sit there and consider his loss. What does it mean, now that Doom is gone and Conan’s great revenge is completed? Is he better off? Has anything really changed? He, perhaps, can be seen to be ‘free’, but free to do what, exactly? Steal? Pillage? Conquer a kingdom like Osric’s? Indeed, later in Conan’s life, he does all these things. But so what? One of the many, many reasons I love this movie is because it shows revenge for what it is: empty and cold. Those who would trade an eye for an eye do not understand the Riddle. The key to the world is not held in a blade, but it is held within yourself. The film is full of people who, on some level, are trying to answer this riddle for themselves – they try to find something external to themselves, something that will grant them power or safety or peace or wholeness. Osric and his riches, the snake cultists and their religion, Valeria and her search for love, Conan and his desire for revenge. None of them find the answer, because they are looking in the wrong place. As Conan sits and broods, does this dawn on him? I do not know. This struggle is a universal one. All of us are seeking the answer to that great Riddle – how do we get what we want? How do we become great? The great majority of us are looking, ultimately, in the wrong place. We should look within for that power, for what else do we have more complete control over than ourselves? Conan’s struggle in life is an exaggerated mirror of our own struggles. We are shaped by our pains and our tragedies and our victories alike, and the realization of this is important. Even as we read this – even as I write this – we nod and say ‘yeah, totally, I get it.’ But we still don’t. We don’t really understand, just like Conan does not. We look around us and see bleakness and tragedy and emptiness, but we are missing those things that are truly fulfilling and which aren’t forged from steel but, instead, from our own flesh and blood. This is the Riddle of Steel; this is, ultimately, the Riddle of Technology itself. Posted on July 12, 2012, in Critiques, Theories, and Random Thoughts and tagged Conan, Crom, fantasy, Riddle of Steel, Thulsa Doom, tragedy. Bookmark the permalink. 8 Comments. A modern re-telling of Conan based on this line could be amazing. That sort of thing has been tackled, I know, but I just really like that line, and it’d be a really interesting story if done well. My grandfather had a saying, “The trick to life, is taking the hand your dealt, and winning anyway.” The riddle of steel is of taking what life gives you, and much like forging and metalwork, honing, and shaping, and working base materials into something beautiful. Like geology, which is the study of pressure and time. Yes i ripped that from Shawshank Redemption, but it is true, if you need a an example, then look at a diamond. It comes from a lump of coal. Thanks! Glad you liked it. Thanks for the comments (and for the playing along!). I will been reading and re-reading this. Well put, this movie has depth that many fail to notice.